The House Next Door is a haunted house story. There are lots of those I know, but this one is a little different. Usually, in books, the haunted house is an old house—a house where people have lived and died, or perhaps been murdered. It’s a house with a bad history. The house in this story is not an old house. In fact, at the beginning of the book, it hasn’t even been built. The other unusual thing about The House Next Door is there are no ghosts in it. 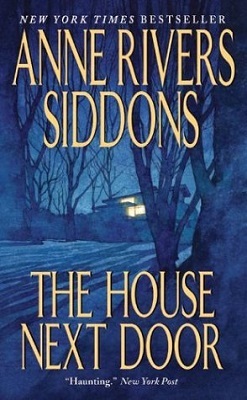 The house in question has an intelligence in it—an evil and very greedy intelligence—but there are no ghosts or old, Indian burial grounds, the evil in this story comes from the house itself. The story is told in the first person, from the point of view of a lady called Colquitt Kennedy who is refreshingly down to earth and unpretentious. Colquitt and her husband, Walter, live in what she describes as a good house, but not a grand one, and it’s in a better neighbourhood than they can really afford because the down payment on the house was a wedding gift from her parents. The Kennedys have two cats, but no children. They are a happy couple, content in their lives and with each other’s company. They even enjoy their jobs. The only problem in their lives is the house next door and the things it does to the people who live there. At the beginning of the book, there is an empty lot between the Kennedys and the Swansons. It’s a peculiar shape with a ridge on it and a creek running through it. Because of this, no architect has been able to build there and the Kennedys and the Swansons have both enjoyed it as an area of natural beauty between the two houses. Then one day Claire Swanson tells Colquitt that someone is going to build a house on the lot. Enter Buddy and Pie Harralson. The Harralsons are a young couple. Buddy has the makings of a good career and Pie has daddy’s money behind her and the makings of a baby inside her. They are young and happy and they have found a brilliant young architect called Kim Dougherty to build their dream house. Kim is a genius and this will be his first house, but what a house it will be! The plans alone are enough to impress Colquitt. They show a house that seems to grow from the ground and blend with the landscape to become part of it rather than to intrude on it. It is a house so magnificent that she cannot imagine the human hands and machinery that will be able to form it. Colquitt’s honest awe at the plans before her is enough to start a friendship between the young architect and the Kennedy’s and Kim’s true brilliance is enough for the Kennedy’s to reciprocate that friendship. Even while the house is being built though, there are strange occurrences. Many dead animals are found on the site and then something rather nasty happens to Pie’s puppy, but that is nothing compared to what happens to Pie herself because she takes a fall on the site and miscarries her child. She and Buddy are still young and healthy though. There is no reason why they cannot try again. The Harralson’s stay in their dream home doesn’t last past the housewarming party, where a lot of unpleasant things happen. None of these things seem at all sinister or connected to the house at the time; it is only later on that Colquitt begins to realize that evil forces are at work. The next family to move into the house are the Sheehans and, once again, their problems seem to be totally separate from the house. The same might be said for the Greene’s but, it’s what happens to them that finally spurs Colquitt and Walter into action. The House Next Door is 346 pages long and is one of the most enjoyable books I have had in a long time. It is a scary story, but in many ways, it’s a very sad story as well because the house destroys the lives of so many people, including Colquitt and Walter, who had been so content with their lot before the house was built.